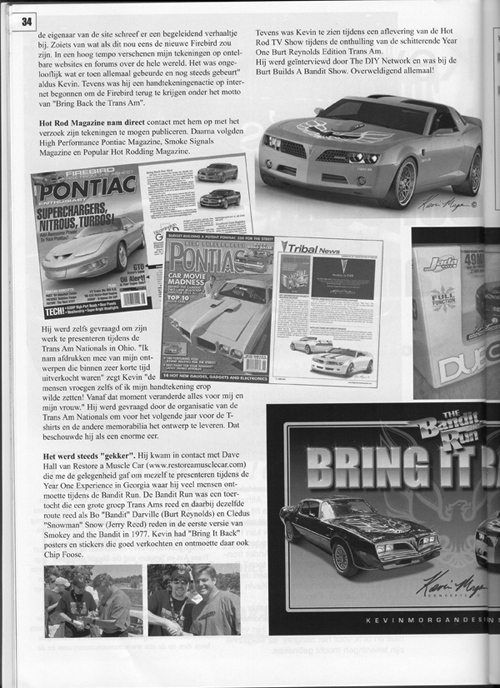 12-17-2008 Kevin Morgan's Concept Trans Am featured in "Stingray '82" Magazine from Holland. Here is the English version of the article. A while ago I discovered drawings of the new Firebird on the internet. That is to say, how he would look like if he was brought back to life just like the Camaro. I too thought how difficult can it be to produce an almost identical model with the typical Firebird looks. Different front, hood and rear lights. Am I right? That too must have thought the maker of the drawings American graphic designer Kevin Morgan from Canton, Pennsylvania. Because I was curious who the maker was of these drawings I contacted Kevin to ask him about his story and to ask permission to use his drawings for the Stingray '82 Magazine. Kevin (35) has been a Firebird fan since he was young mainly because he grew up in the time that the Smokey and the Bandit movies were popular. I think that lots of Stingray '82 members got the Firebird fever too when they saw these movies. "I was born in 1973 and I had a lot of Trans Am & Smokey & The Bandit toys" says Kevin "and the love for the Trans Am never went away. In 2004 I bought my first Trans Am, a blue 1981 T-Top. This way the love for the Trans Am only grew. 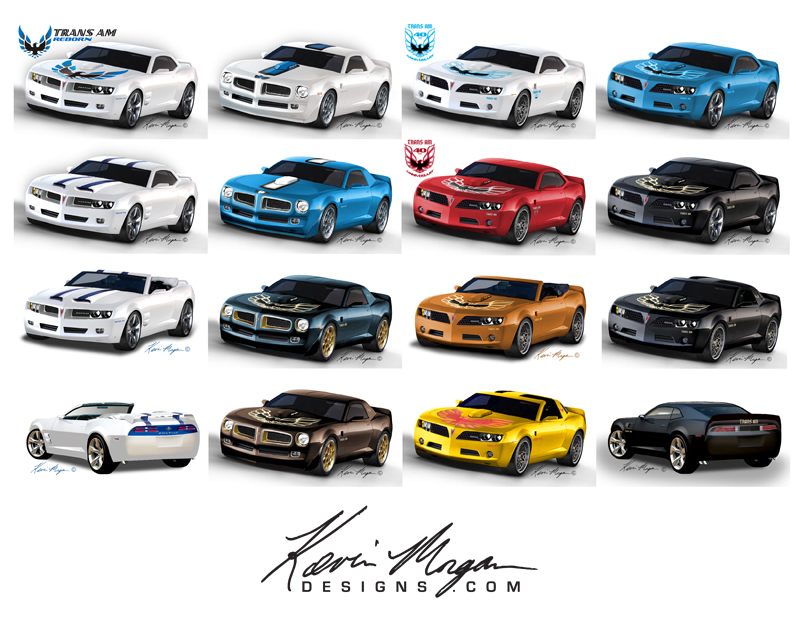 So when the Concept Camaro was introduced in January 2006 I immediately started designing a Trans Am version because it couldn't be true that they would forget the Firebird. I then showed the concept drawings on the www.transamcountry.com site and the owner of that website wrote a "what if " story. From there It just snowballed on the internet and it was showing up on websites and forums all over the world. It was unbelievable what then happened and still happens" says Kevin. He also started a petition on the internet trying to get the Firebird back "Bring Back the Trans Am". Hot Rod Magazine contacted him with the request to have permission to use his concept drawings. 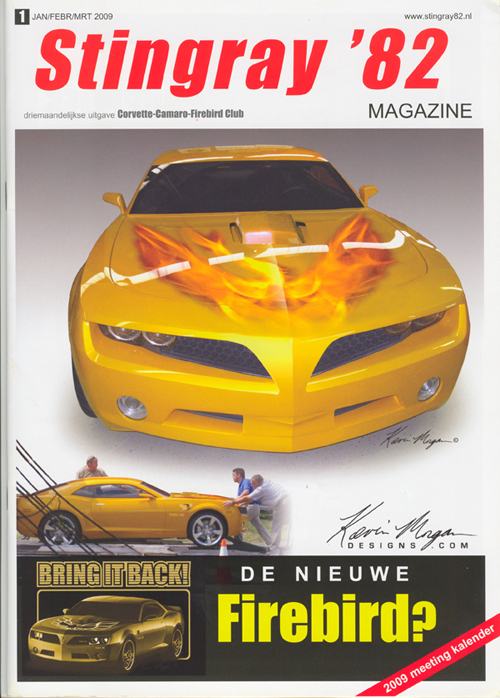 High Performance Pontiac Magazine, Smoke Signals Magazine and Popular Hot Rodding Magazine followed. He was even asked to show his work during the Trans Am Nationals in Ohio. "I took prints with me of my concepts drawings which sold out in no time" says Kevin "people even asked me to autograph my prints! From that moment on everything changed for me and my wife". 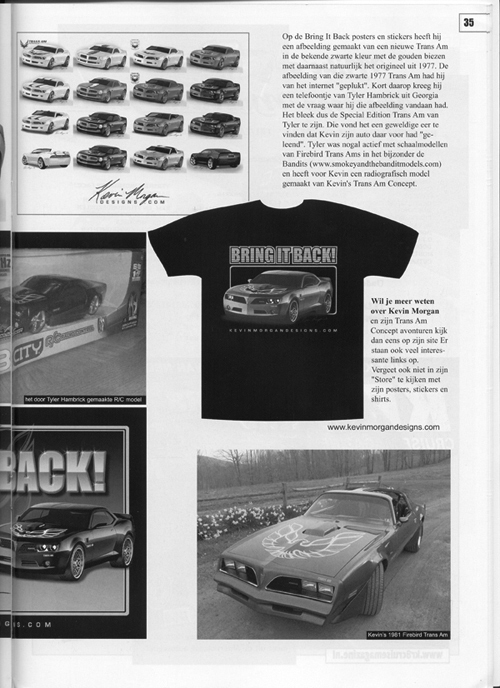 He was asked by the organization of the Trans Am Nationals to design the next year's T-shirts and other merchandise. That was an amazing honor for him. Things got more "crazy". He got hooked up with Dave Hall from Restore A Muscle Car (www.restoreamusclecar.com) who let him set up at the Year One experience in Georgia where he met a lot of the people on the Bandit Run. The Bandit Run was a tour where a big group of Trans Ams drove the same route as Bo "Bandit" Darville (Burt Reynolds) and Cledus "Snowman" Snow (Jerry Reed) drove in the first version of Smokey and the Bandit in 1977. 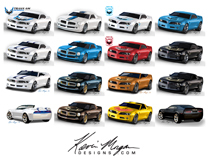 Kevin had with him the "Bring It Back" posters and decals which sold well and also met Chip Foose there. Kevin was also on the Hot Rod TV show during the unveiling of the beautiful Year One Burt Reynolds Edition Trans Am. He got interviewed by The DIY Network and was on the Burt Builds A Bandit show. All overwhelming! On the Bring it Back posters and decals he made a picture of the new Trans Am of course black with the golden stripes besides the original 1977 Trans Am. He "borrowed" the picture of the black 1977 Trans Am from the internet. He got a call from Tyler Hambrick from Georgia with the question where he got the picture from of the black 1977 Trans Am. It appeared to be Tyler's Special Edition Trans Am. He was very honored that Kevin "used" his car. Tyler is very active with building Firebird Trans Am scale models especially the Bandits (www.smokeyandthebanditmodels.com) and made a working R/C model of the Trans Am Concept for Kevin. 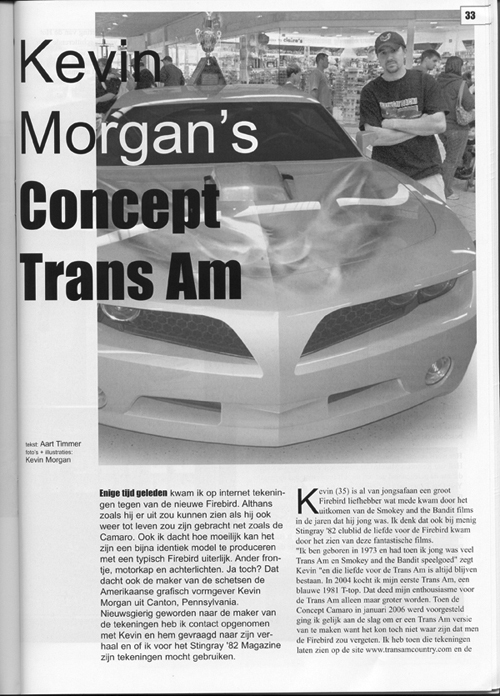 If you want to know more about Kevin Morgan and his Trans Am Concept adventures have a look on his website. It also has a lot of interesting links. Also don't forget to have a look in his "Store" with his posters, decals and shirts.